All Music Tutors from Harmony Music are awarded with professional qualifications and have gained a wealth of teaching experience throughout the years. According to the age and performance level of the individual, each music course is designed to help students progressively master the techniques of the instrument and musicality, while supplemented by basic music theories for a well-rounded music education. Our regular music curriculum is designed for our students to come once a week at a set time (like every Tuesday at 10:00 AM) for an extensive period, so that our students have sufficient time to absorb, review and practice new music materials, and develop their sense of pitch and rhythm after each lesson. 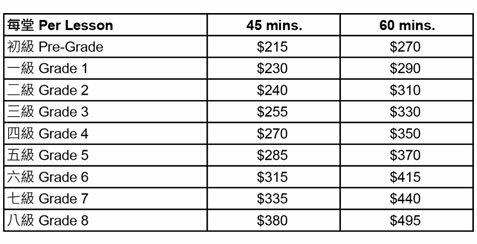 Fees are listed per individual below, and will be collected in the beginning of every 4 lessons. Harmony Music may assist any interested students in our Piano, Violin, Viola, Cello, Bass, Flute, Clarinet, Guitar, Saxophone and Music Theory courses to participate in the ABRSM Music Examinations. For students interested in the Central Conservatory of Music Exams, Harmony Music may assist students in our Chinese Instrument courses to participate. Interested to apply for our music courses? Please fill in our Application Form and read our General Rules. We will come back to you as soon as we can. Just staying in Hong Kong for a couple weeks? Urgently need to perform for special occasions? If you require a more flexible music learning schedule, we also offer customized curriculums that are tailored to each student’s needs. Email us at info@harmony-music.com with your special requirements and we can start to arrange for you!